A man suffered cuts to his face and hands during an assault and attempted robbery at St Cuthbert’s cemetery in central Edinburgh. The incident happened around 11.45pm on Saturday 23 February in the St Cuthbert’s cemetery, just off Lothian Road. A 23-year-old man was cutting through the graveyard to catch a bus when a male approached and punched him to the ground before presenting a knife. An attempt was then made to steal the victim’s rucksack. However, he held on and was assaulted further during the struggle. As a result of this attack, the victim sustained a large cut to his face and other smaller cuts to his hand. The suspect then made off through the cemetery in the direction of Princes Street. Officers are investigating this matter as part of Operation Arable and anyone with information is asked to come forward. The suspect is described only as being white, with a scarf covering his face and speaking with a Scottish accent. Detective Sergeant Mark Lumsden from Gayfield CID said: “Firstly, it is important to stress that crimes of this nature within the city centre are extremely rare and a full investigation is now underway to identify and apprehend the male responsible. “While these inquiries are conducted, uniformed officers will provide a high-visibility presence in the area to speak with members of the public, who may have any relevant information, but to also offer reassurance to our communities that we are treating this incident very seriously and working hard to apprehend the suspect. 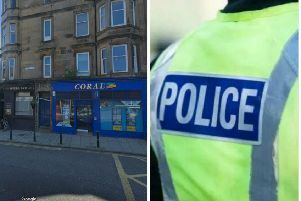 “If you remember seeing any suspicious activity in the area around the St Cuthbert’s Cemetery late on Saturday evening, then please contact police immediately. Those with information can contact Gayfield CID via 101 and quote incident number 5489 of the 23rd February. Alternatively, an anonymous report can be made to the charity Crimestoppers on 0800 555 111.